In the four stages of Islamic conquest, one of the major objectives by Muslims is the intentional effort to undermine the host government and culture. While there are many other ideologies grasping for the eventual power grab, the Islamists have managed to embrace them all, from the socialists, Communists, and those who they label “marginalized”. Welcome to the third stage. 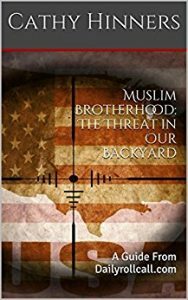 No longer are Muslims in America concerned with their”peaceful” image, or blending in with American culture, no, now it is about promoting a caliphate, but do millions of Americans have a clue? No they do not. On Oct 18th, in cities across the United States, Muslims gathered to celebrate and oppose the latest travel ban attempted by President Trump to be implemented for the security of the American people, which once again liberal courts struck down. One of those Muslims speaking at a rally in D.C was self proclaimed activist Linda Sarsour, who at the end of her speech declared the streets as “our streets”. We no longer can just listen to what the Islamists say, we must hear them. All Muslims that follow in the prescribed footsteps of their prophet Muhammad must push for the caliphate, where Islamic law is the only law of the land, and Islam the only “religion”. Because of their religious designation, masses of Americans have accepted their beliefs,even empowering them as they take to the streets. Urging citizens to defy and resist what they call a white supremacy administration, is jihad. Jihad in Arabic means struggle, Jihad in Islam means “holy war”. In another speech delivered at the same rally in D.C, CAIR attorney Hassan Shibly states to the Muslim attendees “you are what made this country great.” He further states they must continue to fight for justice, not just for the Muslim community but for “humanity” and continuing the message of mercy that Mohammed commanded. “There is no comparison whatsoever between what this world has seen the “non-Muslims” do and what the Muslims have done. The two World Wars in which 70 million people were killed were “Christian” wars. If we just listen to their message we may believe they are about love, justice and peace. If we HEAR what they are saying, we will understand what is really the meaning behind their words. The third stage is upon us, will we allow it to continue to the fourth? Evil, proudly walks! “Our streets”. The President works for ” US!” Wake Up America! They are here! The numbers are up and they are running the show! Why, don’t people, pay attention? The 9/11 Event should be on tv – every day! Please remember! Why, do you think, we go through HELL every trip- to the Airport! Think of the children, in the next generations. EVIL! Complacency is a slick road to shackles and enslavement. You desire Sharia, remain silent. You desire to be enslaved by savages remain silent. You desire to watch as your liberties are slowly taken to the point you barely notice the slide, remain silent. Woe to those that see the coming enslavement and but whimper. Folks, no one else is going to do it for you, you must each and every one lends a voice and yes scream until your very neck is severed. This malignant Muslim Sharia cancer will not go away and soap and water will not wash it off. Inshallah, death to all Muslims KALB’S. THEY BRING DEATH, DISEASE , WANTON TERROR AND YES HAVE DECLARED WAR ON US. You can either sit cowering in your homes or face this scourge on the society of Democracy and Freedom. Our forefathers gave us this nation with their blood, how will you hold on too it?